You will be delighted with my fresh blueberry recipes. 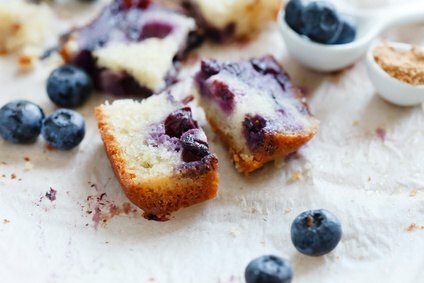 I offer homemade blueberry dessert recipes including moist blueberry bread, blueberry butter, homemade blueberry cake, blueberry sauce from scratch and more below. 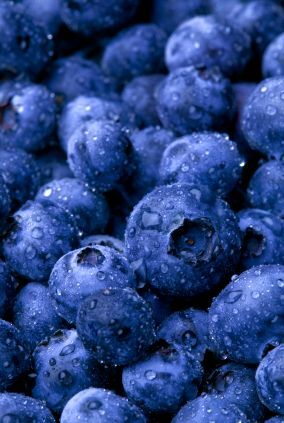 When selecting blueberries, pick firm, dry berries that have a subtle whitish bloom over a uniform blue-black color. The chalky bloom color is a sign of freshness, not mold. Keep ripe berries in a covered container in the refrigerator (use them for my fresh blueberry recipes) for up to one week. Inspect them right after you purchase them and discard any soft or damaged ones as well as any debris. Blueberries may be frozen - though the taste and texture will be slightly altered. Don't wash fresh blueberries until you are ready to use them. The chalk-like bloom on the skins helps keep the berries fresh. 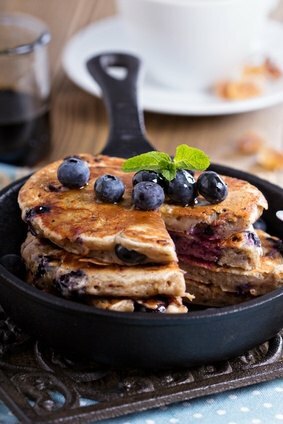 When adding fresh berries to batters (such as pancake batter or muffins, etc), dust them lightly with flour and add them last - to prevent them from sinking to the bottom of the mix and becoming unevenly distributed. This is a wonderful fresh blueberry recipe. PREHEAT oven to 350 degrees; grease and flour a loaf pan. Sift together the flour, sugar, baking powder and salt. Add the oats. Add the eggs, vegetable oil, nuts and mashed bananas; mix until combined. Flour your blueberries and fold them into the batter gently. Bake for 60-70 minutes; cool in pan for ten minutes. Remove and cool completely. NOTE: This recipe also makes awesome blueberry banana muffins. Just spoon the batter into your muffin cups. Bake until they are light golden brown. This is such a delicious fresh blueberry recipe. Moist and tender. PREHEAT oven to 350 degrees; grease and flour a loaf pan or any baking dish. You may also grease and flour a muffin tin. Cream together the butter and sugar. Add the eggs - one at a time, and then the vanilla. In another bowl, sift the dry ingredients and stir some of the flour mixture in with the butter mixture. Add some of the milk and combine, repeat again with the flour mixture and then adding the milk; until well combined. DO NOT OVER MIX. Gently fold in the blueberries. In a loaf pan bake the cake for 45 to 50 minutes; and in the muffin tin, bake for 25 minutes. I love cheesecake, and this fresh blueberry recipe takes the cake. Combine the first three ingredients and press into the bottom of a 9" springform pan. Beat the cream cheese until creamy and add the sour cream, sugar, vanilla and flour. Beat in the eggs; one at a time. Gently fold in the 1/2 cup of blueberries. Pour over the graham cracker crust and bake for approximate 1 hour or until it is firm to the touch in the middle. Cool completely. Run a butter knife along the edges of the pan to loosen the cheesecake and place on a serving platter. Place blueberries over the top and melt the grape jelly; spoon over the blueberries to glaze them. Chill for a minimum of four hours. Words cannot describe this fresh blueberry recipe for homemade blueberry cobbler. The recipe can easily be doubled and put in a 9x13 pan. PREHEAT oven to 350 degrees; grease a 8" baking dish. Add the first four ingredients together and mix well. Next add the milk and butter; stir. Spread this batter into the prepared square baking pan. 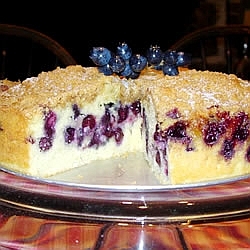 Sprinkle the fresh blueberries evenly over the batter. Sprinkle with sugar and drizzle the vanilla over the top. Bake for 40-45 minutes (9x13 pan about 35 minutes), or until the toothpick inserted comes out clean. Did anyone say serve with vanilla ice cream? Loving this sauce. Another one of my fresh blueberry recipes that are wonderful. In a saucepan, combine the sugar and cornstarch. Stir in the lemon juice and water until smooth. Add the blueberries and bring to a boil over medium heat, and cook until smooth - or approximately two minutes. Cool slightly and serve warm over ice cream or pancakes; or refrigerate. I also like to eat this fresh blueberry recipe for sauce all by itself. 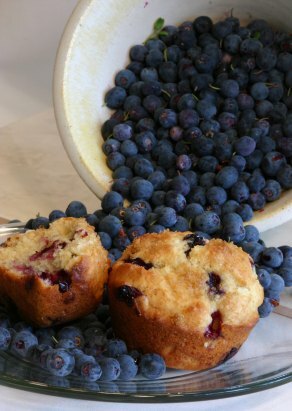 I know some of you don't have the time to bake some of my homemade fresh blueberry recipes, but these muffins taste like they were made from scratch. PREHEAT the oven to 400 degrees; spray your muffin tin with vegetable oil. Gently combine all the ingredients (except the blueberries) in a bowl and stir until mixture it is just moistened. Over stirring will yield tough and cone-like muffins. Fold in the blueberries. Spoon batter into muffin cups; approximately 9. Bake for 13-15 minutes, or until they start turning golden brown. Cool slightly before serving. Dissolve the Jell-O in the hot water. Cream the cheese. In a blender or food processor, puree 2-1/4 cups of the blueberries. Fold 1-1/4 cups of pureed blueberries into the creamed cheese and fold in the whipped cream. Pour into an 8" square pan. Chill until the Jell-O has set. Garnish each serving with the 1/4 cup of blueberries. I love this fresh blueberry recipe. Mix flour and baking powder together and set aside. Cream butter, sugar, salt and lemon zest on medium high for 3 minutes or until light and fluffy. Beat in vanilla. Add eggs one at a time and beat after each one. On low setting, add flour mixture and beat until almost incorporated. Scrape down sides and stir with a rubber spatula until combined. Fold in blueberries. You may bake this in a square or round 9 inch pan, spray first with vegetable oil. Pour in cake batter. Set aside. Combine flour, sugars, cinnamon and salt on low speed until well combined. Add butter and mix until it resembles wet sand and there are no large butter pieces. Sprinkle streusel evenly on top of the cake and bake for approximately 55 minutes, or until deep golden brown and toothpick inserted in the center comes out clean. Let sit and cool for 15 minutes if you want to serve it warm. Cut into wedges and serve. This will become one of your favorite fresh blueberry recipes. Cream butter and sugar until light and fluffy. Add eggs, one at a time and beat after each one. Add vanilla, baking powder and salt. Fold in half of the flour and add half of the milk and combine. Repeat. Do not over-stir. Fold in the blueberries and spoon into muffin cups. Sprinkle with raw sugar. Bake muffins for 20-30 minutes or until lightly golden brown and springy to touch. You will be begged to make this fresh blueberry recipe. Often. 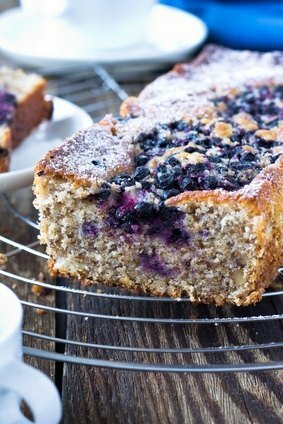 This is a lovely and melt-in-your-mouth fresh blueberry recipe for bread. PREHEAT oven to 350 degrees; grease a loaf pan. Combine the first 5 dry ingredients and set aside. In a bowl, beat the butter until creamy and add the white sugar. Beat for 30 seconds and add the brown sugar; beat again until fluffy. Next add the eggs one at a time and beat until combined. Finally add the sour cream and vanilla and beat together. Stir this creamed mixture into the dry ingredients just UNTIL moistened. Do not OVER STIR. Beat the butter in a mixing bowl until light and fluffy. Add the powdered sugar and beat thoroughly. Fold in the blueberries, and chill until ready to serve. This is also wonderful with biscuits and bagels. You may also substitute strawberries for the blueberries. There is nothing like this fresh blueberry recipe. Combine flour, white sugar, baking powder and salt. In a separate bowl, mix together egg, milk, vegetable oil and blueberries. Stir flour mixture into blueberry mixture; batter will be slightly lumpy. Heat a lightly oiled griddle or cast iron frying pan over medium high heat. Pour or scoop the batter onto the griddle, using approximately 1/4 cup for each pancake. Cook until pancakes are golden brown on both sides; serve hot. You'll be begged to make this fresh blueberry recipe. 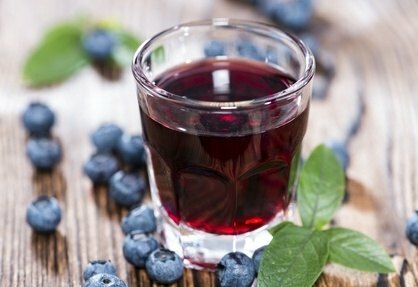 More blueberry recipes...How about some cocktails? Thaw the blueberries and mash with a fork in a bowl, and then add to a quart canning jar. Add the lemon zest, cloves and vodka. Seal the jar tightly and store in a cool, dry place for 90 days - shaking the jar gently every week or so. After 3 months, strain the blueberries and filter through a cheesecloth. Pour into a quart jar. Pour in the simple syrup and tightly seal - shake the bottle gently until well combined. Store in a cool, dry place for 30 days more. When ready to bottle, strain again through a cheesecloth and pour into the decorative bottle. Serve with 7-Up or club soda in a two to one ratio. Enjoy, it's well worth the wait. **Double, triple, quadruple vodka amount just be certain to do the same with the other ingredients. If you are waiting three months - you might as well make a big batch! To make the martinis: In a cocktail shaker, fill with ice and combine 2 parts blueberry liquor with one part raspberry liqueur and a dash of lime juice. Shake until frost forms on the outside of the shaker and serve in a martini glass. Prick the blueberries with a cocktail skewer and place in the martini. May also add a twist of lime zest. Another great fresh blueberry recipe. Combine ice, blueberries, blueberry nectar, seltzer, limeade, lime juice and tequila, if using, in a blender and blend until smooth. Rub rim of 2 glasses with lime wedge and dip in sugar. Divide the margarita between the prepared glasses and serve. Whisk together the egg yolks, sugar and vanilla until well incorporated and smooth. Pour cream and milk in a saucepan, and over medium - heat until very hot - NOT BOILING. Reduce heat to low and add 4 TBS of the hot milk (one at a time) to the egg mixture and whisk after each addition. Pour the egg mixture back into the saucepan of hot milk and cream, whisking constantly. Cook on low heat, stirring until the mixture coats the back of a spoon - or for 4-5 minutes. Remove from heat and cool, and then refrigerate until cold. Thaw blueberries and chop slightly in a blender or food processor. Fold into the cream mixture. Start your ice cream maker - pour in the mix and process according to manufacturer's instructions. Scrape ice cream into a freezable container and freeze for 3-24 hours. The ice cream will be very soft at first, and will be very hard after freezing. Let sit in room temperature for a few minutes before serving. Sprinkle with blueberries on top. Mix blueberries with 1 tablespoon of flour. When the batter is ready, very gently fold the floured berries into the batter. The blueberries will not bleed and not end up on the bottom of the pan. PREHEAT oven to 375 degrees. Grease and flour a 9 inch spring-form pan. Sift together the flour, baking powder and salt. Set aside. In a large bowl, cream together the butter and sugar until light and fluffy. Beat in the egg. Beat in the flour mixture alternately with the milk, mixing just until incorporated. Stir in the blueberries. Pour batter into prepared pan. In a small bowl, combine brown sugar, 3 tablespoons flour, cinnamon and chopped pecans. Cut in butter until crumbly. Sprinkle over the batter. Use my homemade whipped cream to dollop on top.